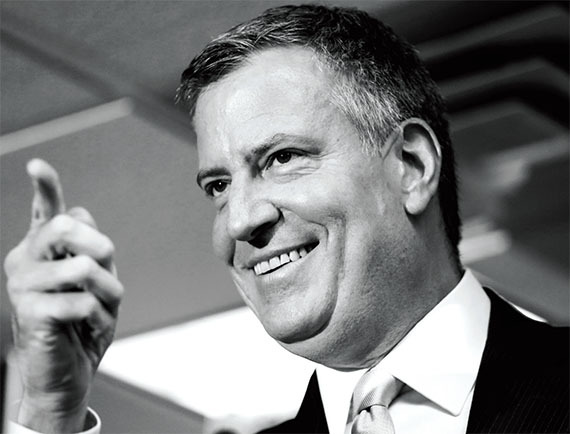 Does Mayor de Blasio Care About Landmarks? What’s more, his administration has made some moves that generated dismay. Most notably, shortly after de Blasio appointed Meenakshi Srinivasan as the chair of the city Landmarks Preservation Commission, she proposed to “de-calendar” almost 100 sites and neighborhoods waiting for historic designation, including some that had languished for decades. “We wanted to address the issue of backlog,” Srinivasan told The Real Deal, a situation both sides said needed to be addressed. After opposition from preservationists, the commissioner, a trained architect who previously served as chair of the city Board of Standards and Appeals, withdrew the plan and asked for input from the community on how to address the matter. “She got off on shaky footing,” said Peter Bray, a Park Slope Civic Council trustee. Just 10 minutes into describing a new Gansevoort Street development, the architect’s presentation was already going off the rails. Harry Kendall, a partner at BKSK Architects, broke off mid-sentence from the first slide and turned to a cluster of women. The current plan, which would involve the demolition of two buildings on Gansevoort Street, the construction of two new buildings, one at the corner of Washington and Gansevoort Street reaching approximately 120 feet in height, and the addition of four stories on top of the iconic row of two story market buildings at 60-68 Gansevoort Street, runs completely contrary to the entire purpose of the designation of the Gansevoort Market Historic District, and would destroy many of the very features the district is intended to celebrate and preserve. 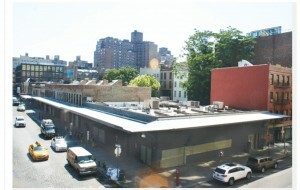 As the organization which originally proposed and, along with many others, fought for the designation of this district, we would find the approval of this plan or any plan which includes these basic components a tragic and devastating blow not only to the Gansevoort Market Historic District, but to landmark designation and historic preservation in New York City. Gansevoort Street forms the heart of the Gansevoort Market Historic District, and its cobblestoned street surrounded by low-scaled market buildings encapsulates exactly what is so unique, visually pleasing, and historically significant about the Meatpacking District. This proposal would erase many of these key elements and features. Transforming the row of two-story market buildings at 60-68 Gansevoort Street into a six-story building merged with a new, adjoining 8-story, 120 foot tall structure would completely change the scale and feel of this block which serves as a gateway for thousands of people each day to and from the Meatpacking District, the rest of the West Village, the High Line, the Whitney Museum, and the Hudson River Park. Concerned residents living in and near the district packed a room above the Gansevoort Market food court on the evening of Tues., Aug. 18, to hear the developer’s proposal for a row of new buildings that will reach up to eight stories and replace some of the one- and two-story market buildings that currently line the block, between Greenwich and Washington Sts. “I think Gansevoort St. has been a blight for the community,” Jared Epstein, vice president and principal at Aurora Capital Associates, told the meeting. 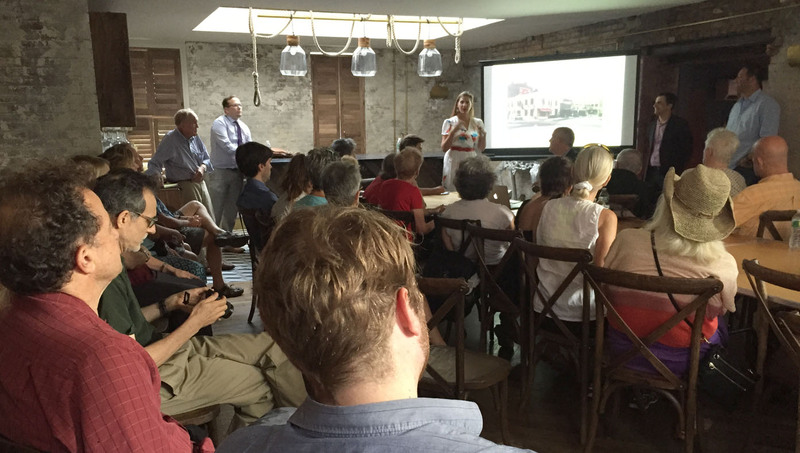 There was a GREAT turnout for the community meeting with the Gansevoort Towers developer; the room was packed. The project is even worse than we thought. Our guesses about the heights of the buildings were close (they will be about 111′ and 88′) but we were surprised by how massive they are – these things are ugly. We’ve posted all the details of the project on our Proposed Gansevoort Towers page. 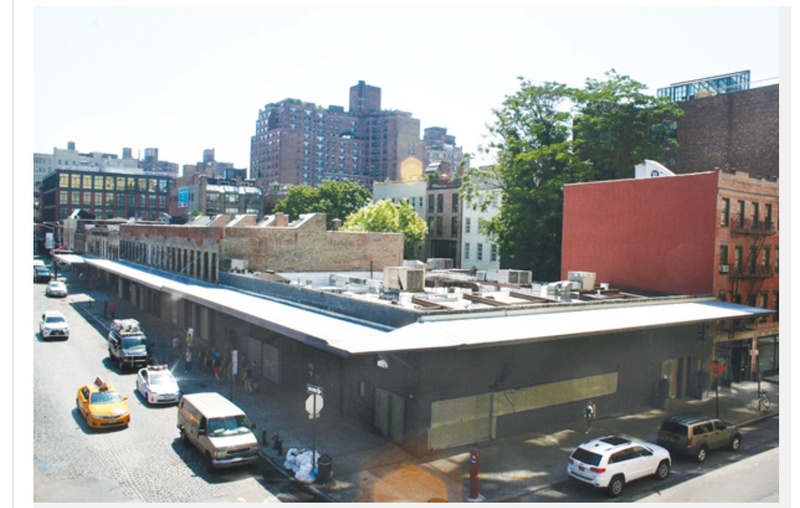 Aurora/Gottlieb and their architect, BSK Architects, will be giving a detailed presentation of their plans for the entire block on the south side of Gansevoort Street between Greenwich and Washington Streets. This will be an opportunity to learn exactly what the developer hopes to do, and to ask questions. The meeting will be held at 58 Gansevoort Street, 2nd Floor, above Gansevoort Market, on Tuesday August 18th at 6.30pm. 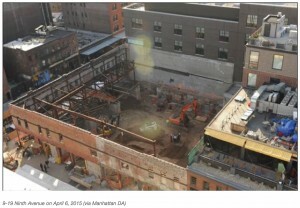 Manslaughter Charges For Contractors at Aurora/Gottlieb Site in The Meatpacking District. Manslaughter charges have been filed against two contractors at the site being developed by Aurora/Gottlieb on Ninth Avenue in The Meatpacking District. 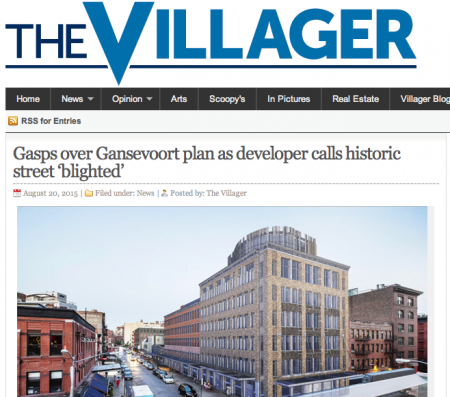 The same developers (and architect) are behind the proposed towers on the south side of Gansevoort Street. The charges arise from the treacherous conditions that existed during excavation inside the old Pastis building, resulting in the death of a worker. The worker who died, Carlos Moncayo, 22, an Ecuadorean immigrant who lived in Queens, was crushed by thousands of pounds of dirt when the walls of a site in the meatpacking district, steps from the High Line, collapsed around him on April 6. Prosecutors said on Wednesday that the two managers — Wilmer Cueva, of Sky Materials, and Alfonso Prestia, of Harco Construction — had ignored repeated warnings for months from private inspectors that treacherous conditions existed at the site on Ninth Avenue.